Latest post Mon, Feb 19 2018 2:35 PM by Leo. 2 replies. I organize my bins in Thumbnail View, and with many different setups with grouped A and B cameras, I like to view in a Pyramid view. So I put the Group Clip on top, and the A and B cameras right below it next to each other. But I spend an embarrassing amount of time trying to manually align them to be flush next to each other. It'd be so great to have them "Snap" to align with one another. In the same way that Photoshop aligns layers by showing the alignment line, or how After Effects recently implemented that for layers. I've been manually aligning for as long as I can remember and I'd so much appreciate if they'd snap into place! Hello. I came across your post and even though it's several months old I thought I'd make a reply for other people searching since I've found a great solution for organizing group clip footage in frame view. If you click on "Bin > Align and Fill" you'll see an option called "Align Selected to Grid". The regular "Align to Grid" often doesn't work because of how you might want gaps between groups and what not. 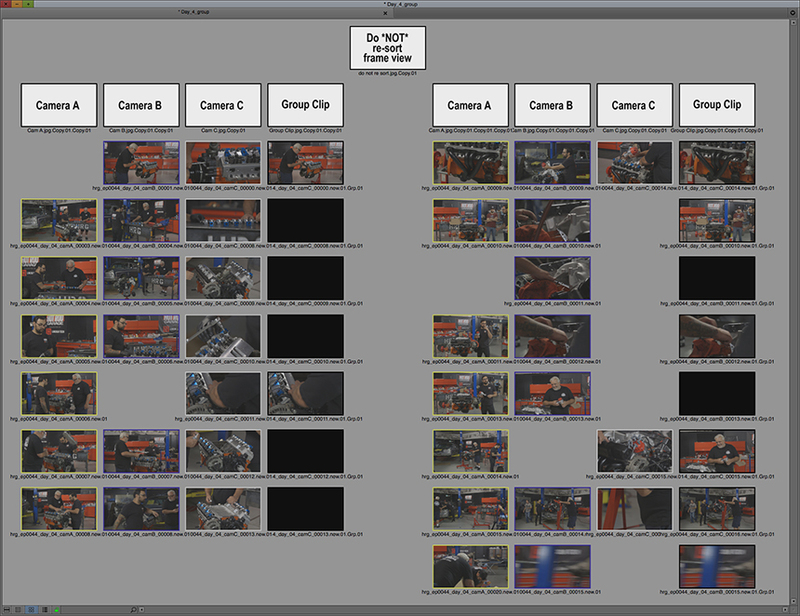 Since I deal with a lot of multicam footage coming from 3-4 cameras, I've developed a column style organization with labels that I cooked up in Photoshop to make the organization more clear (I work in an evironment whith multiple editors and I always want to be sure that any editor that opens one of my bins can easily find their way around). "Align Selected to Grid" won't work for the exact pyramid sorting you laid out because the top clip resides between the two below it, but you can line up the lower ones to the grid and hand place the one on top or come up with a different layout that works better with grid alignment. Here's what one of my typical group clip bins looks like. Note that there are gaps (which indicate one camera start/stopping while the other kept rolling, or where a camera wasn't rolling at all). With the labels at the top of the columns it makes it easy to see the organization despite the gaps. I also use color coding to better differentiate the camera angles. I've set up my timeline to show source colors so it's easy to tell camera angles on the timeline. Thank you! Very useful and nice frame ordering. Would love to have a special section with editors sharing their ordering methods... i miss this a lot all over the internet!